How Do You Pull Off the Fool's Mate, Chess' Fastest Checkmate? 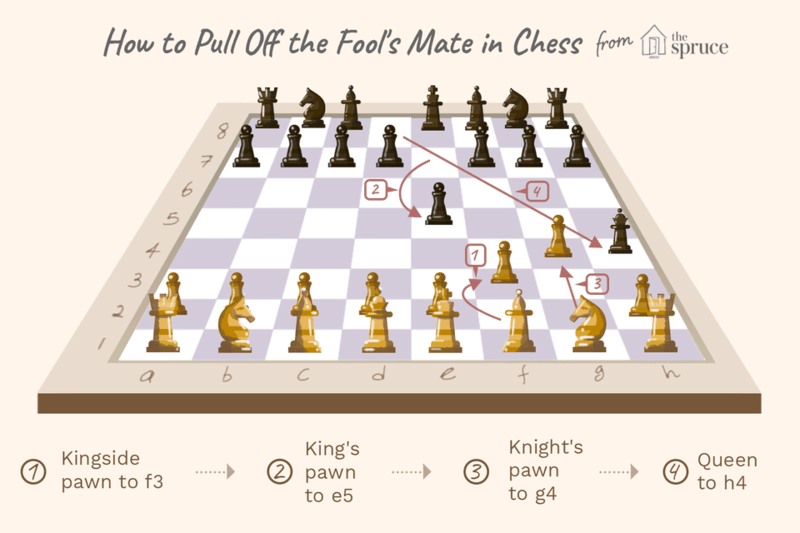 Fool's Mate is the fastest way to checkmate your opponent in the game of chess. This rare form of checkmate can occur when the White player makes two ill-advised mistakes. Chess is a game of learning to respond to and anticipate your opponents moves. If you are playing Black, learning the proper response when you spot these particular opening moves by White can lead you to the speediest victory possible in the game of chess. Fool's Mate begins with a weak first move by White—kingside pawn to f3. This move does little to influence the center of the board, doesn't help to develop any pieces, and weakens the king's defense on the e1-h4 diagonal. White has already given up its opening advantage, but the situation isn't yet hopeless—though it soon will be if White makes another mistake. Black's response, king's pawn to e5, is a strong reply. The move gives Black great influence in the center of the board and helps develop the dark-squared bishop and the queen, who aims to take advantage of the weakened White king by moving to h4. In the starting position of chess, White always has a slight advantage. In this game, after just one move, Black already has the superior position. White can develop two of its pieces because of the pawn move, but it has lost the option of moving its knight to f3. 1. f3? e5 2. g4??. White's second move, knight's pawn to g4, is another blunder. The move fails to improve White's position and weakens the already dangerous e1-h4 diagonal. Even discounting Black's winning reply, the move makes little sense. While it technically allows the kingside bishop to move out, that bishop still can't get out from behind its own pawns. Even if it moves to h3, the g4 pawn blocks it from entering the rest of the battlefield. Had White recognized this first error, it might instead have moved the second pawn to g3, thereby blocking the e1-h4 diagonal and buying some time. Instead, with this move by White, Black is poised to checkmate on just the second move. 1. f3? e5 2. g4?? Qh4 mate!. Black finishes off the game by moving its queen to h4. White cannot capture the queen, move its king to safety or block the queen's attack. In just two moves, White finds himself checkmated. This illustrates both the powerful nature of the queen, as well as the dangers of opening lines to your king in the early part of the game. White could have avoided this mess, but instead violated the basic opening principles of controlling the center of the board and maintaining king safety. A better approach would have been for White to advance its central pawns, which could have helped control the middle of the board, allowing its knights and bishops to safely enter play. Pawn moves in the opening phase of the game are important, but they must serve a purpose. Understanding these principles will help you avoid suffering the humiliating Fool's Mate.